Arkham Horror Third Edition revisits the town of Arkham (again - are we getting bored of this world yet?) and pits players against Lovecraftian apparitions and anomalies all the while managing their own health and sanity. Players take on the role of an investigator moving and fighting their way around different sections of the town trying to uncover clues, both in terms of gameplay and actual clue token to defeat the scenario. There are 4 scenarios in this game which all feel quite different from each other and even when replaying a scenario no two games are identical. 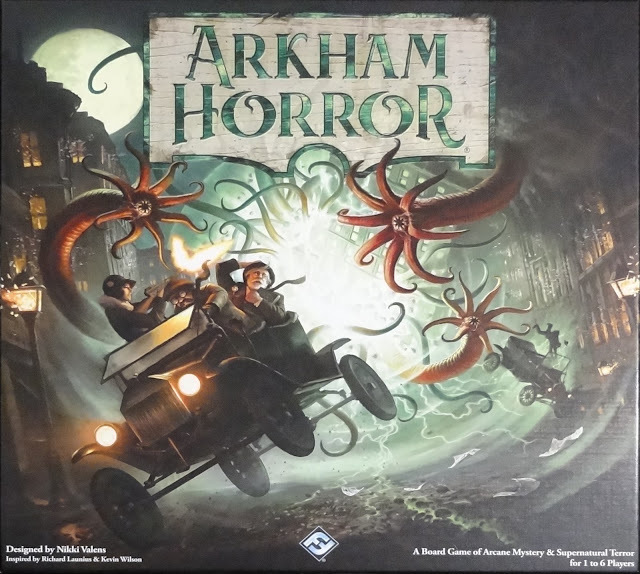 Thematically Arkham Horror sits between Eldritch Horror which deals with Cthulu infestation on a global scale, and Mansions of Madness which has you running about a building fighting the evil minions. Arkham Horror has you warding off evil on the scale of the eponymous Arkham town. Full disclosure though, I have not read, nor intend to read any of Lovecraft's books, I am aware of some of the lore but wouldn't describe myself as a fan. This game has been on the streets for a few months now; FFG has had three cracks at getting this game right and because I haven't played the earlier versions I won't comment any further on the differences between them, but I will provide my thoughts of this as a stand-alone game. You can watch my unboxing video here: https://youtu.be/L5ynYkqkbJM. 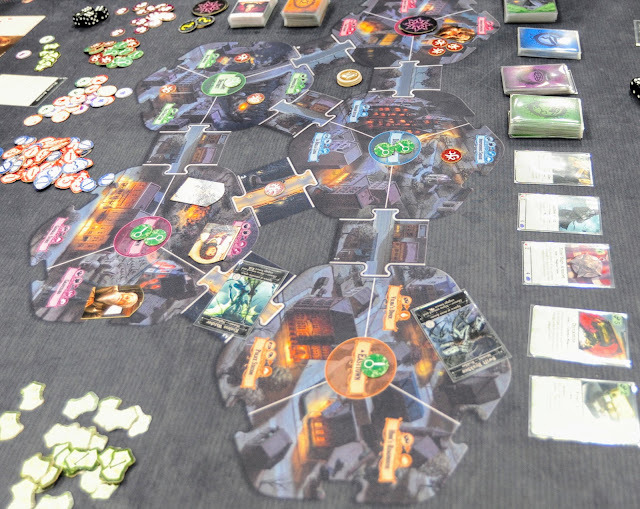 Each round consists of four phases that repeat until the players either achieve the scenario objectives, or enough doom has infested the town to defeat the players. During the first phase, the Action Phase, players take turns to perform two actions. Anybody familiar with the majority of FFG rule-sets will be in familiar territory here (Move, Attack etc.). Cooperative games often allow for self-determined player turn order and this is no different, however, once my group was familiar with the game if our characters were in different neighbourhoods (often the case) we went ahead and played our actions concurrently. This significantly sped the game up - after the obligatory group-think at the beginning of the turn. When players were in the same neighbourhood there was often a synergy of actions that required a little more thinking of who should go first for the best outcome. After the players have all moved the monsters on the board will activate according to their own specific objectives. The different Monster types have different activation actions, some will run towards the nearest character, others are immobile and just fling doom around. The different monster behaviour, for me, helped to breath a lot of life into this theme. I wouldn't want to count the number of Lovecraftian games there are on the market but we [gamers] show no sign of being tired of it yet; at least we seem to be out of the Zombie-everything era. After the monsters have activated available players (i.e. those not engaged with a monster) will have an encounter. The Encounter Phase is my favourite part of the game; the NPCs and events that you deal with during an encounter add tons of flavour into this game. You'll draw a specific card depending on where your character is in the town and read out a specific text depending on how many doom tokens are in the same neighbourhood as you. This will often result in taking a test of character. This is done by rolling a number of dice dependent on the particular attribute being tested. The attributes are familiar from the other Cthulu-universe games that FFG have pumped out e.g. Lore, Will, Intelligence, Strength etc. Your particular attribute score means you roll that number of dice, any 5 or 6 results (normally) means you've passed the test. The timing mechanism by which Events cards are added to the different Encounter decks is a brilliant piece of design and scales well for any number of players. Each time a clue is 'found', a Clue token is placed in the centre of the neighbourhood in which it was found. This will also add an Event Card to one of the top three cards of that Neighborhood's Encounter deck (each neighbourhood has its own). When drawing an Encounter card during this phase, there is a chance you may draw that Event Card which is the primary mechanism to advance the game and achieve scenario objectives. The fourth and final phase is the Mythos Phase in which players will blind draw two mythos tokens from a bag. Each token will cause a specific effect (usually bad) for the players to deal with. This phase did tend to slow the game down a little bit but the resolution of all the effects was engaging enough to keep players attention, even if the interval between your last Activation and starting your next turn could be upwards of 15 minutes, a lot more with 6 players around the table. It was often a relief, in more ways than one, when a blank Mythos token was drawn. During the game, players will also acquire items, spells, and conditions which generally, help the players. These, along with each character special abilities, are a crucial tactical element to beat any scenario. On my first playthrough, I ignored these additional pieces and quickly lost. I played this way primarily to learn the basic mechanics before teaching one of my game groups. However, I got sucked into this learning game enough to push on until I lost my solo playthrough with two characters. When you play with all the rules (as is intended) all the scenarios felt 'winnable' but always challenging, in fact, I haven't ever won a scenario on the first playthrough, but they were all fun enough, and crucially, quick enough to try again on the same night. The combat mechanism is very simple, players can attack any monster they are Engaged with, by rolling a strength test. The number of passes (5s or 6s rolled) is the number of hits applied to the monster. If the monster survives to Activate during the Monster Phase the player takes a number of damage and horror tokens that are shown on the bottom of the monster's card. There is no defence roll, you simply take the damage. Initially, I didn't like the simplicity of the combat but I realised this game is more than a typical 'kill all the things' monster game and combat is secondary. This way, it is is very streamlined and doesn't detract from driving the scenario along; combat is actually just right for this game - this is not a fighting game. Although players can die, you are always able to re-enter play with another character, albeit with some scenario-effecting penalties. I like games that both kill player characters off with no chance to revive, which I think adds to the realism and jeopardy of your actions. I also like games that don't allow for player elimination. This game neatly straddles both of these requirements and it reminded me a little bit of Magic Realm; any game that does that is doing alright in my book. I hold FFG up as a company at the very pinnacle of component quality, if not design at all times (here's looking at you Discover), this game is no exception. The components are fantastic and you get a plethora of different card decks - even multiple types of the same decks. The rulebook(s) are very well laid and they follow the two-book method of many other FFG titles I am familiar with, amongst others. You get a 'Learn to Play' book which does exactly what it says, and a 'Rules Reference'. The 'Learn to Play' book is very well written and we had only a few occasions where we were unsure of a rule enough to warrant looking up the detail in the reference rule-book. The Neighborhoods are depicted on large hexagonal tiles which join together with small rectangular streets. The locking mechanism is a simple puzzle-piece, tabs and slots affair. I found that the tolerance of the cutting was so fine that when joined the pieces would not easily go together (or apart) and when prised apart caused some pulling away of the printed surface from the underlying card stock. This is both a pro and a con as you get a very firm game board at the expense that it might start to wear quickly. But there is no denying the game looks great on the table and is beautifully illustrated throughout. As with most FFG games there is an abundance of card decks and tokens to keep track of the game state and that of your player characters. Despite the relatively small footprint of the map elements of the game board you're going to need a massive table or be very organised to sit 5 or 6 players around this. It is a huge table hog. Obviously, all of these pieces are set up before the game and to give you some idea of how long setup takes, almost half of the rulebook (yes you read that right) is dedicated to Setup! I wish setup was a bit quicker if this game continues to find table time I will have to invest in a better solution than plastics bags to facilitate setup. Cooperatives often don't work well with either of my game groups as we tend to group-think which drags the game on a bit too long. This is our own fault and despite the streamlining of the game it did start to overstay its welcome near the end of a scenario. However, that didn't always stop us from re-playing it either because it does tell a good story and each play (aside from the major plot points) are quite different. It would be ideal if the playtime could be trimmed just a little bit more but I am at a loss to think of where there is any cruft that could obviously be lost. Apart from the first few turns of the first game, where we didn't fully appreciate the consequences of our actions, the game felt well balanced, i.e. easy to play but hard(ish) to beat. The play time on the box is largely accurate with most of my games straying up to 3 hours with 3 and 4 players. This is a highly polished and fun romp in the Lovecraft Universe. Gamers appear to still be eager for more Cthulu and whilst I appreciate the accomplished gameplay and immersive story, I'm not overly sold on the theme itself, which is no criticism of the game. However, there's no denying the theme shines through throughout this game. I did enjoy my time with this game and would recommend it to any fans of cooperative games who are looking for something with a little more chrome than Pandemic. If you're a Cthulu fan then I would imagine this is a no-brainer game to seek out and play, if not to add to your collection. Most game-stores will have a copy of this game in and you can use this link http://www.findyourgamestore.co.uk/ to find your nearest.